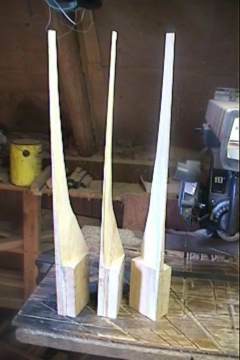 I built these blades after purchasing the Blade Designer program from Windstuffnow.com. I wanted to see how much better the performance would be over my first set. 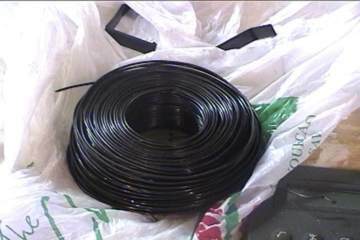 I made the length the same (40" diameter) but used the correct station/pitch/chord measurements from the program. I had intended to turn the same dc motor (as a generator) and compare the power output of the two windmills. I still plan to do that, but in the last few weeks I've been reading more about homemade alternators. 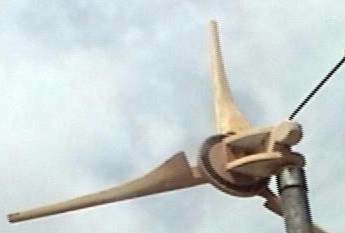 To make the alternator for this windmill I made a flywheel to mount the blades on with a slot in the back to accept small permanent magnets. Here is a picture of the armature with the magnets. Now for the stator. After making a couple single phase coils it's time to make a 3 phase. Winding coils is my least favorite part of the windmill hobby. I took a different approach with this one. With Corel Draw I made a picture of the armature, marking off the 26 magnets. I stuck this to a piece of Styrofoam insulation and covered it with a piece of plastic food wrap. 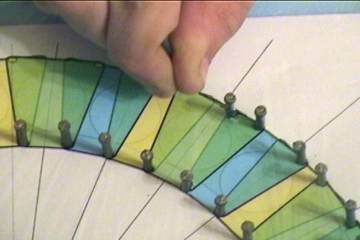 The nails are to hold the coils as they are wound. In a single phase stator, there is 1 coil per magnet... wound alternately clockwise then counter clockwise to match the north - south sequence of the magnets. 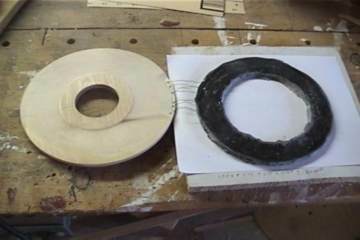 In this 3 phase stator there are 3 separate windings. In each winding the coils are all wound counterclockwise and skip every other magnet. 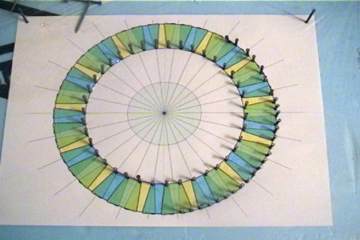 Each winding is offset 1/3 the distance between 2 magnets. In the above photo each phase is represented by a different color - yellow, blue or green. Here are the 3 pieces of wire that make up the 3 phases. Instead of wrap the first phase completely and then the 2nd, I made 1 revolution of winds with the 1st phase, then 1 rev with the 2nd, then 3rd etc. I am hoping that intermingling the layers this way will keep all 3 phases the same average distance from the magnets. 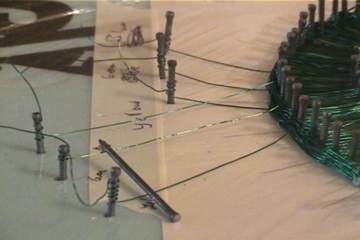 One drawback to this method may be that the extra wire used between coils is not positioned to convert magnetic flux to electricity. 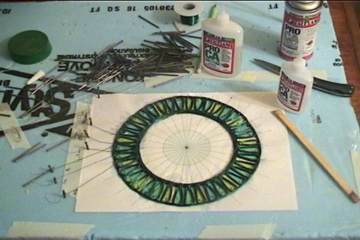 Instead, it adds to the resistance of the winding. We'll see how it well it works. After the winds are done, I crushed them as flat as possible and glued them with super glue (cyanocrylate) and kicker. When the alternator is finally assembled, it is important to keep the air gap between the magnets and the coils as thin as possible. I laid the coils face down and used some masking tape to build a mold around it for the fiberglass resin. 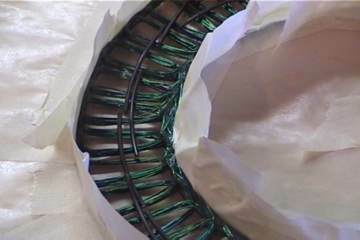 Layers of metal behind the coils will also increases the magnetic flux that will be converted into electrical energy. It is best to use material that will be attracted to a magnet but not retain a magnetic field of it's own. 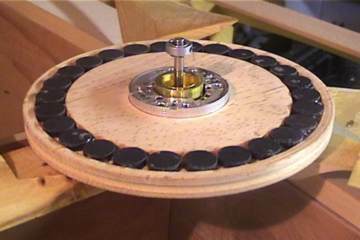 If the metal backing became a magnet itself, it would "hold on" to the real magnets, requiring more wind for the rotor to start turning. The material I used is soft iron wire used to tie Reebar together for concrete work. After the resin cured, I mounted the coils to a wooden backplate. 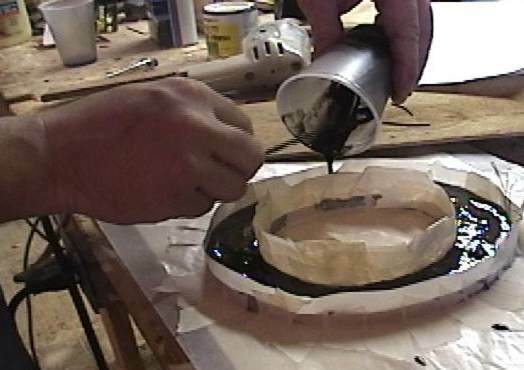 The hole in the backplate will fit perfectly on the bearing housing of the windmill. 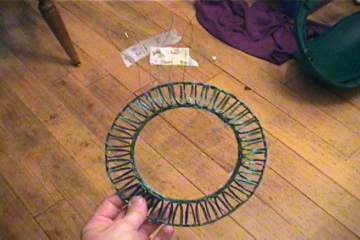 I assembled the stator and the rotor, without attaching the blades. 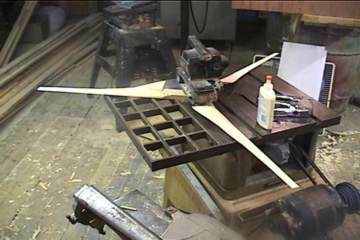 I used a small variable speed drill to spin up the rotor and then I measured the voltage, what there was of it. I have to say I was pretty disappointed at the result... barely 3 volts. I decided to make another coil using many more winds of wire per coil.